On the second day of Pavithrotsavam, after Snapana Thirumanjanam(celestial bath) special puja is performed to the silk woven holy threads called “Pavithralu” which are the sanctified threads. The unique feature about this thread is that it has five colours which are Black, Blue, Red, Yellow and Green. 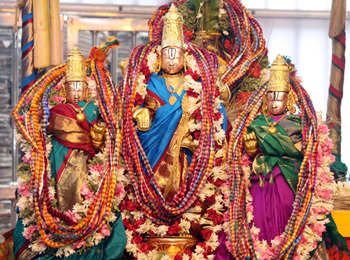 “Pavitralu” will be tied around the head, neck, waist etc of Lord before taken for the procession. They are also tied to various deities inside the temple as well as deities of sub-temples located inside the prakaram including Ananda Nilaya Vimana Venkateswara Swamy, Yoga Narasimha Swamy etc. and also to Lord Sri Bhuvarhaswamy located adjacent to Swami Pushkarini. These holy silk threads are woven out of a special variety of high quality cotton which is grown exclusively in the land that is meant to grow Tulasi plant.